I'm now back in Melbourne after my short trip up north to Cairns. It's amazing how one country can have such a variance in weather. Cairns was a sunny 27c and when we arrived back in Melbourne last night it was a very chilly 7c!!!! But then it is good, if you get sick of the cold Winter weather you have the option of heading up north to thaw out. Tonights "I Love" is an obvious and easy one. "I Love My Kids". It was such a wonderful feeling spending time with them. When they were little my Mum game them the nicknames - "I Want" for Shane and "Me Too" for Rachel. The reason being that Shane was always saying "I Want" and Rachel being the little sister who followed her big brother everywhere and wanted everything the same as him would follow up with "Me Too". Well I must say some things never change - those two little people are now 28yr and 30yr and Rachel was still saying "Me Too" when Shane said he was going to do something. 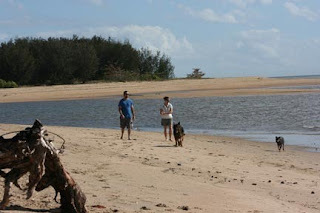 This photo is when we were going for a morning walk along one of the Cairns northern beaches with the dogs - Mitch and Bosco. What a beautiful way to spend the morning. Such a variance in temperatures but as you mentioned, you can leave one place and go on to a warmer or cooler spot... what wonderful freedoms and choices you have Davine. That is so nice Davine. I'm happy for you.